At Mentorloop we encourage all mentees to make it as easy as possible for their mentors. Ready to build a great mentorship? Let’s go. Check out your mentor’s digital footprint. Are they on Twitter or LinkedIn? Do they have a blog? Send through a quick bio or intro via Mentorloop chat. Just a bit of info on your career, where you want to go, and how they can help you get there. Consider your goals for this mentorship. Your mentor will likely ask you “what do you want to achieve here?” It’s good to have an answer. Your mentor is there for support. But do them a favour and consider how they might help you. How often do you want to touch base? Will it be a Skype call or at the local cafe? Eyes on the road, hands on the wheel - you’re responsible to drive this relationship. At your first meeting, let your mentor know you’ll be tracking success and stay committed to it. Keep track of your journey with meeting notes and actions. Present your goals in a clearly articulated fashion. Be ready to suggest some realistic timelines. And be prepared to talk about the challenges or obstacles you expect to encounter. A great way to make sure both parties are benefitting is by checking in with your mentor to see if anything could make the time more valuable for them. Find a way to show your appreciation. If you’re meeting virtually, send a quick thank-you email afterwards. If you’re meeting in person let them know the coffee is on you. Follow up with a summary email. 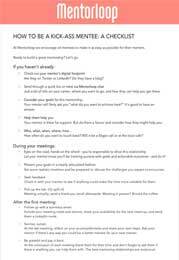 Include your meeting notes and actions. And share your availability for the next meet-up. Send them an invite to connect on LinkedIn or follow their blog. What’s the point of a great relationship if you can’t stay connected? Preparing for each recurring meeting is similar to the first. Have they published a new blog post? Read it. Thought of new actions for your goals? Consider how to action them. At the last meeting, reflect on your accomplishments and share your next steps. Discuss how you'll maintain contact going forward. And ask them if there’s any way you could be a better mentee for your next mentor? Be grateful and pay it back. At the very end of your relationship, try to find a unique way to show your appreciation - a handwritten note or a small gift is more than suitable. A mentor is not a therapist. Try to avoid conversations that veer away from your goal or objectives. They’re not a recruitment agent either. Avoid the temptation to ask them for a job. And they’re definitely not your parent. They’re not here to solve your problems for you. Contacting your mentor every time you have an issue is a quick way to kill the vibe. It’s as easy as that. Not rocket science, but a little preparation goes a long way. And demonstrating that you’ve given this meeting some proper thought ahead of time will put your mentor at ease. Now go forth and find that human reconnection!